Create custom tasks to track time against. You decide what tasks people can charge against on their timesheet. Add unlimited tasks. You can even make them different for each project. Mark tasks as billable or non-billable. Some activities you bill a client and other activities you consider overhead. WeWorked accommodates both scenarios within tasks. 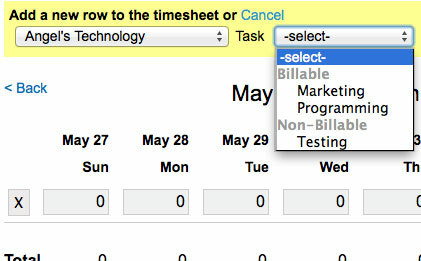 Tasks can be marked billable or non-billable. 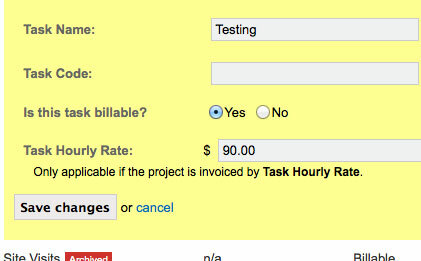 Run a report with billable tasks to let WeWorked perform all the calculations. Know exactly how much to bill a client. People only charge to the tasks you create. WeWorked reduces timesheet errors by only allowing people to see tasks for the projects that they are assigned. See at a glance which tasks are billable and non-billable. Archive tasks whenever you like. Sometimes you need to prevent people from charging time to a task. You can archive tasks to temporarily or permanently stop people from selecting them. Clearly see which tasks are archived. Whenever you are ready, restore a task.